Let’s just get to the point. 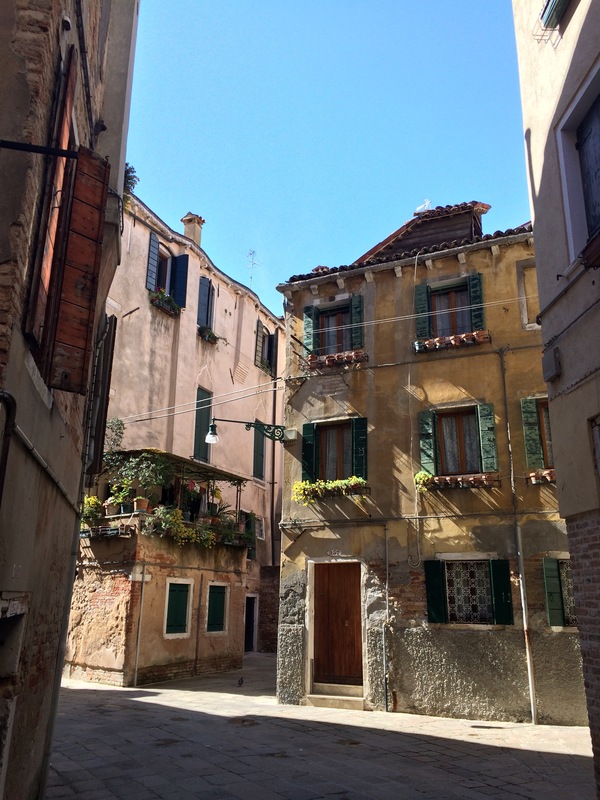 Not long after arriving in Venezia my iPhone went a bit nuts and ended up imploding which led to a photo dump. (I suspect it was from taking videos and far too many photo. The phone really seems to hate the videos most of all.) I’d thought the photos would be saved on the iPad we brought, but well, I was wrong. The photos will be missed, but the greatest regret is that I won’t be able to post images from our visit to the Giardini Botanici Hanbury near Ventimiglia, Italy. Much planning went into that day trip, and the photos somehow made it all worth the effort. We awoke early, took the train from Genova to Ventimiglia, bought our bus tickets, waited for the bus, and then we experienced the best of the Italian Riviera for the rest of the day. While waiting at the bus stop after our garden visit, we met a British couple who’d walked there from the French town just over the border and were taking the train back to their hotel that night, while we were leaving from the same station to return to our apartment. While chatting, a woman in a car that had exited a garage across the street asked if we needed a ride back into town. 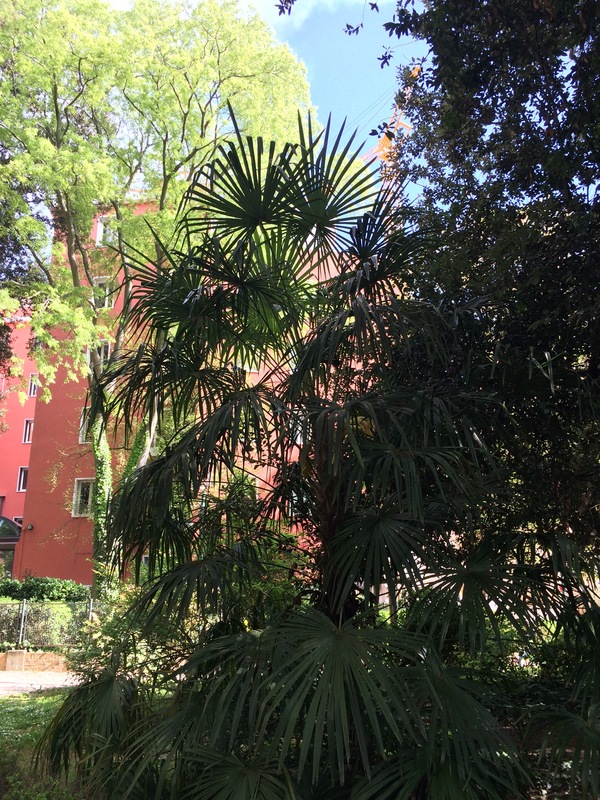 Turns out a Hanbury family member is still there—although the garden is now part of the University of Genova. She was a wonderful guide during our short ride and once again I am reminded that true plant people are a small lot of people and we love crossing paths with other plant people. Well, rather than cry over spilled milk, I’ll move on to the next course. 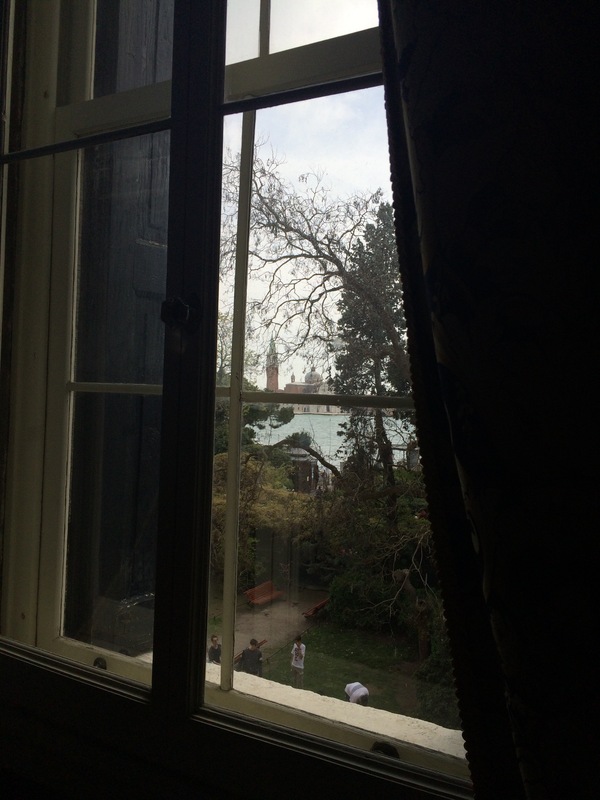 I Giardini Reali (The Royal Gardens) as seen from one of the restored rooms in the former Royal Palace, now part of the Museo Correr. During our last trip here we’d stumbled upon this little patch of green near the water at St. Mark’s Square and it immediately reminded me of Paris. Turns out that Napoleaon had his hand in the development of this spot while in power here and while he lived in the Royal Palace. Only a few of the rooms remain, but from this window, it’s clear to see how the garden must have served its purpose. Our apartment door is to the right. 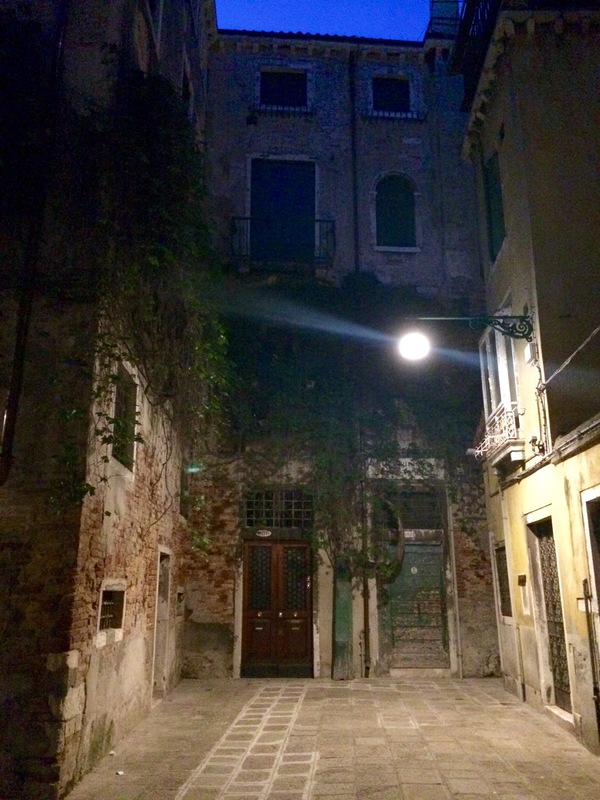 This is our little deadend street at night. We’re staying near the Rialto Bridge just steps away from the Rialto Market. This is what the view can be like just walking to the supermarket in the evening. 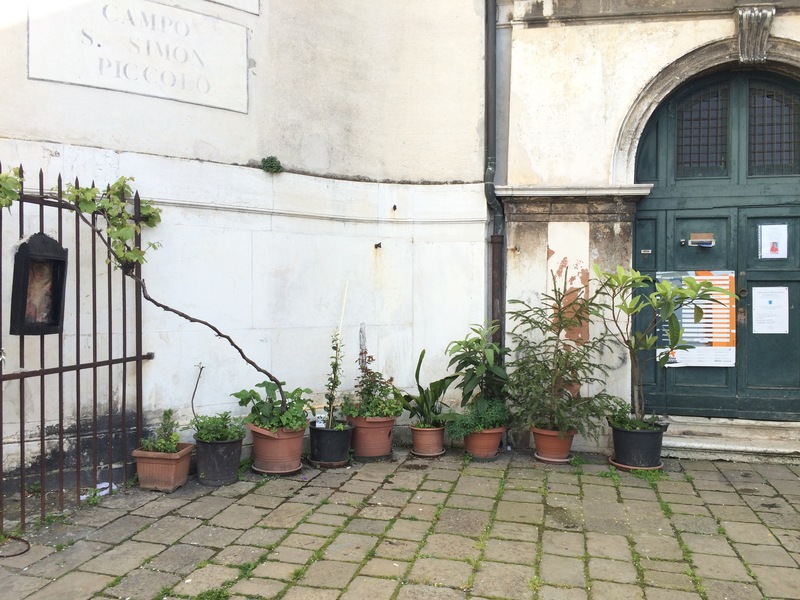 Italians feel much differently about plants and gardening than many other cultures and I am not going to begin a big discussion on the matter other than to back them up. 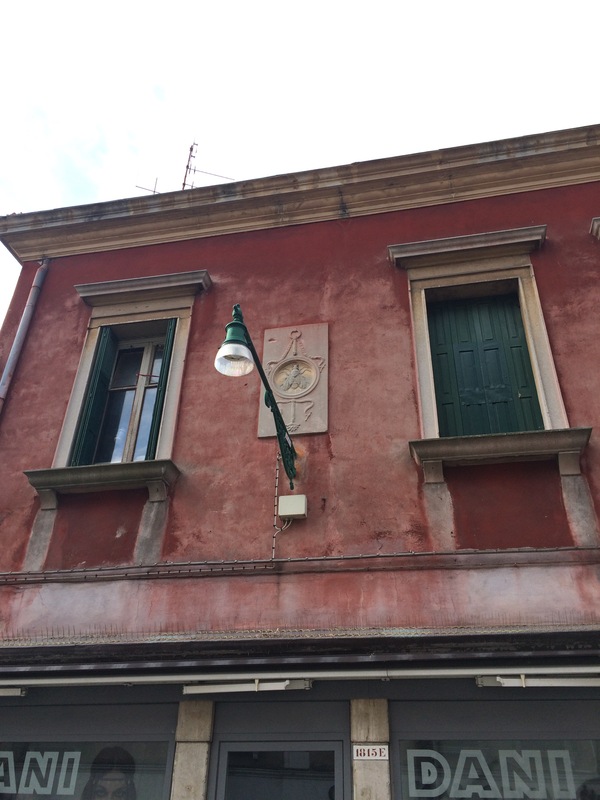 I hear time and again the remark that things could look better if they just tidied things up but then this wouldn’t be Italy and its people would no longer be the quirky Italians that foreigners so admire. 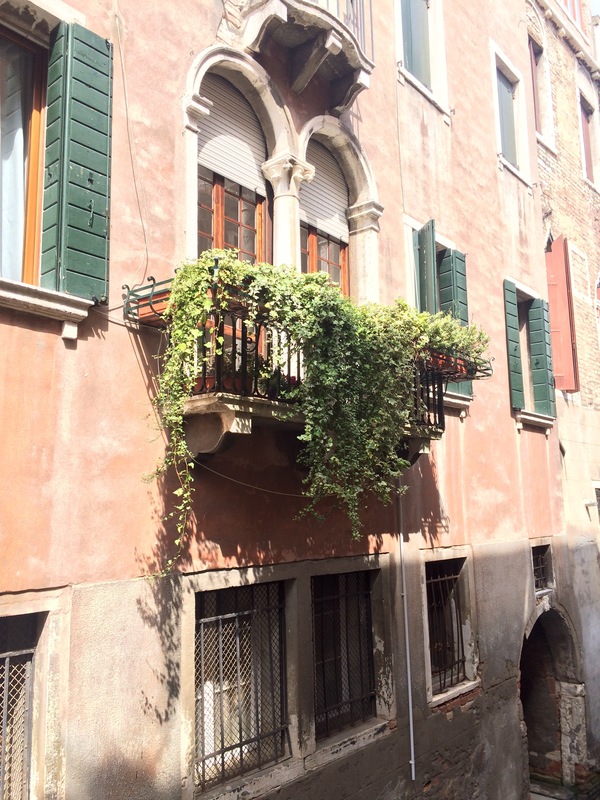 Balconies full of wild messy ivy are quite commonplace all over Italy—especially so in Vencie. 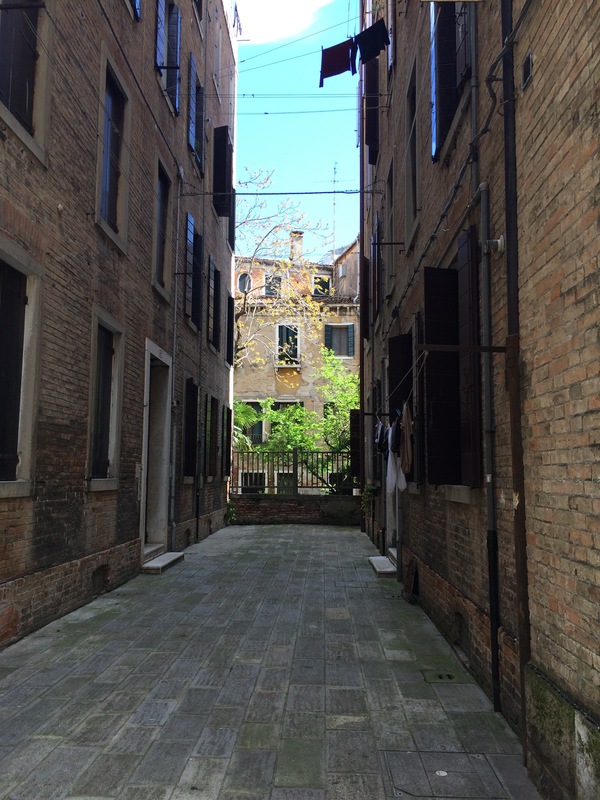 With low light coming in between the buildings in the narrow canals and streets it makes sense and is very low maintenance. The other common combination you’ll see up higher on rooftop terraces will be something along these lines: screen plants (optional), tomato plants (not optional), marigolds or calendula, geraniums, herbs, maybe a rose or jasmine vine if their rooftop has something for it to climb on, agave (optional), other foliage plants (optional). They really do keep it simple around here. In addition to being used as an herb, bay laurel (Laurus nobilis) is still used culturally to connote victory just as it has for many centuries. 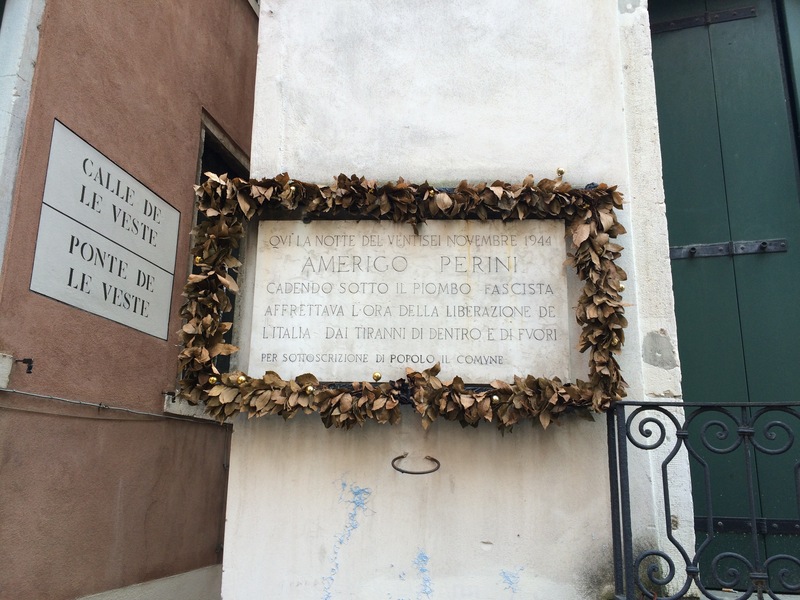 Memorial signs such as this are given large frames or wreaths covered in laurel leaves, and newly graduated college students still walk the streets of Venice this time of year wearing their laurel crowns and singing together. It is nice to see plant symbolism and tradition at work. Since I am ever the traveler wandering about while managing my own chronic health problems, it is nice to see such fine seats. 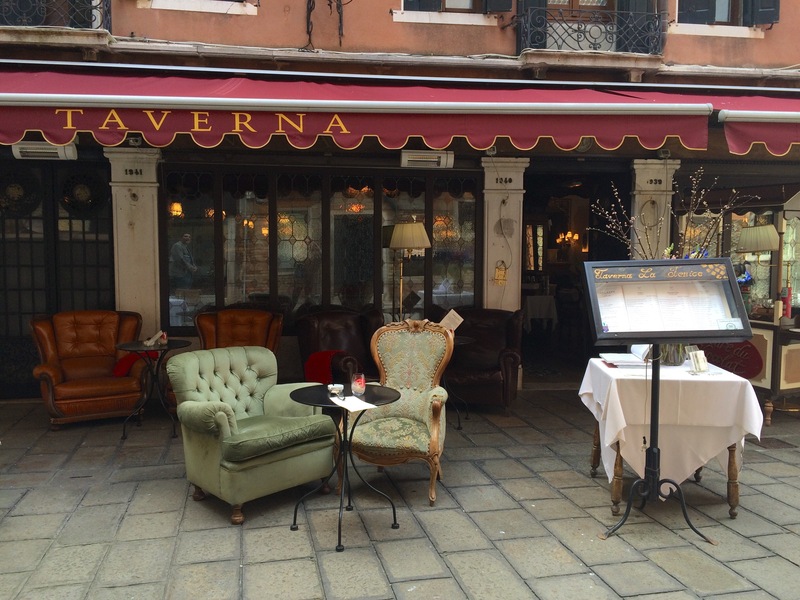 Seeing these near La Fenice made me realize I really should get some portable comfortable furniture for the garden this summer. I think that our elderly cat will approve of the idea too. 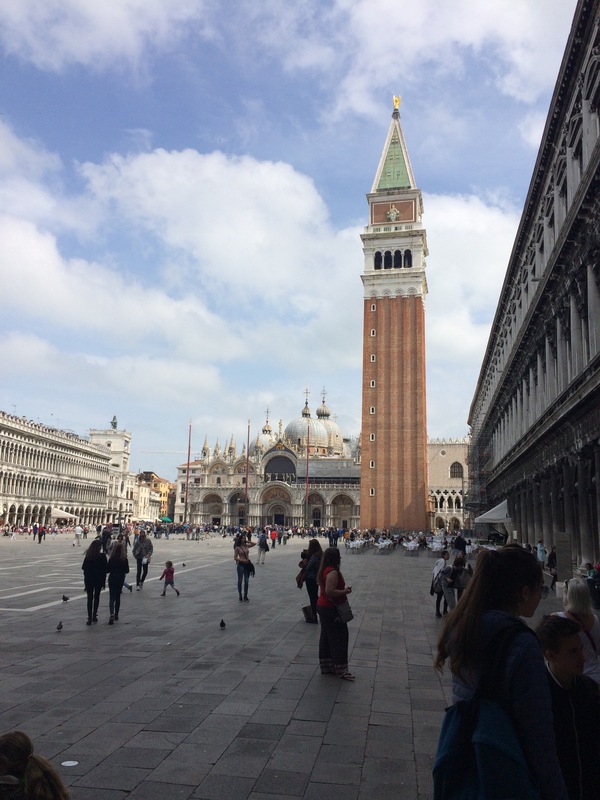 Piazza San Marco has nothing to do with gardening, and there are no plants, but it is magnificent in its design. This trip we visited the interior of the church and the mosaic work was truly stunning. 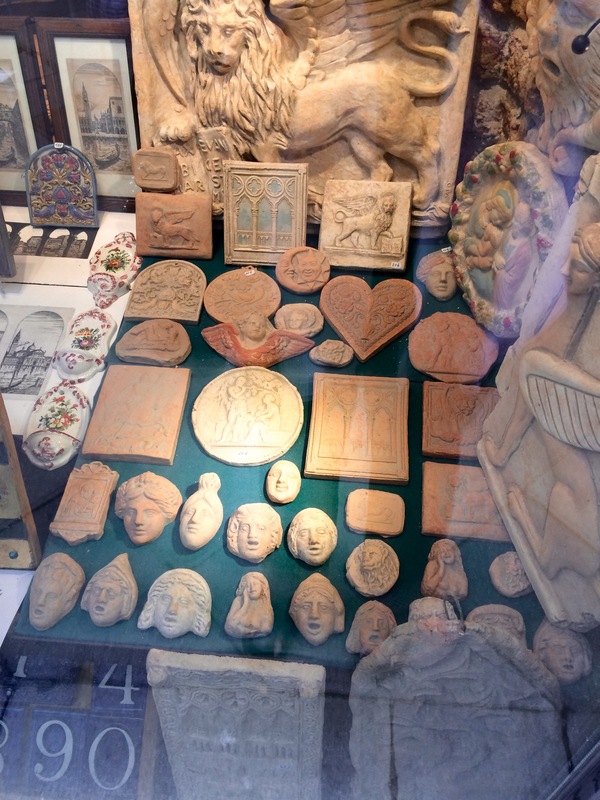 When I return home, I want to begin making mosaics again. 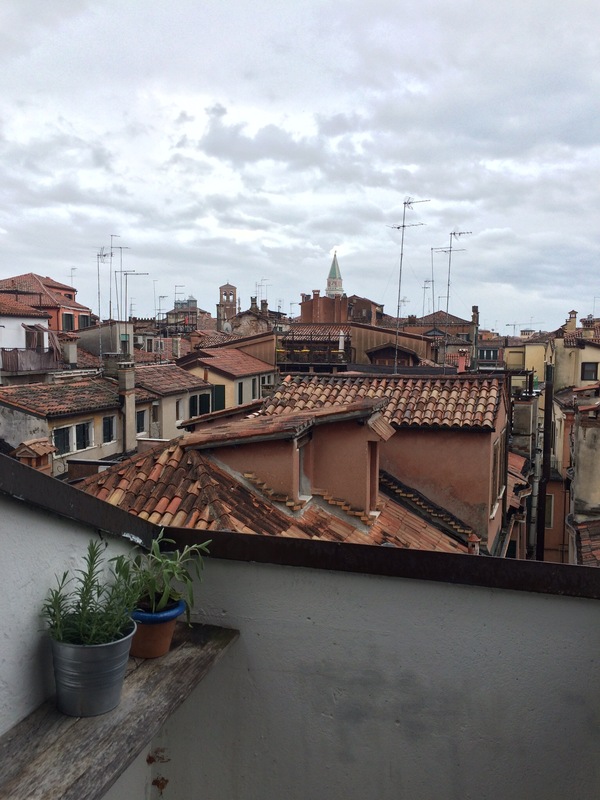 This is the view from the roof of St. Mark’s Basilica. There are museums and art all over the city. Since Medusa is one of my favorite mytholical creatures, I snapped a photo of her on Athena’s aegis. 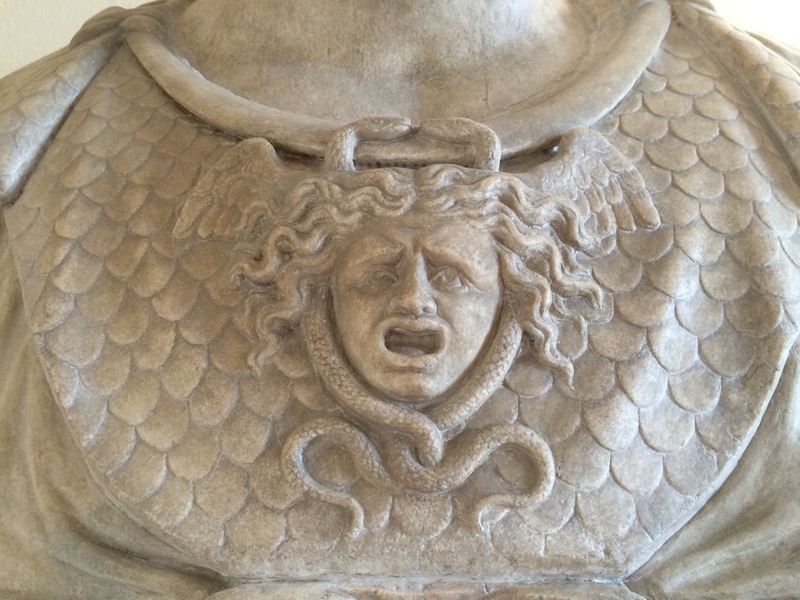 This is from a sculpture that’s a Roman copy of a Greek original. 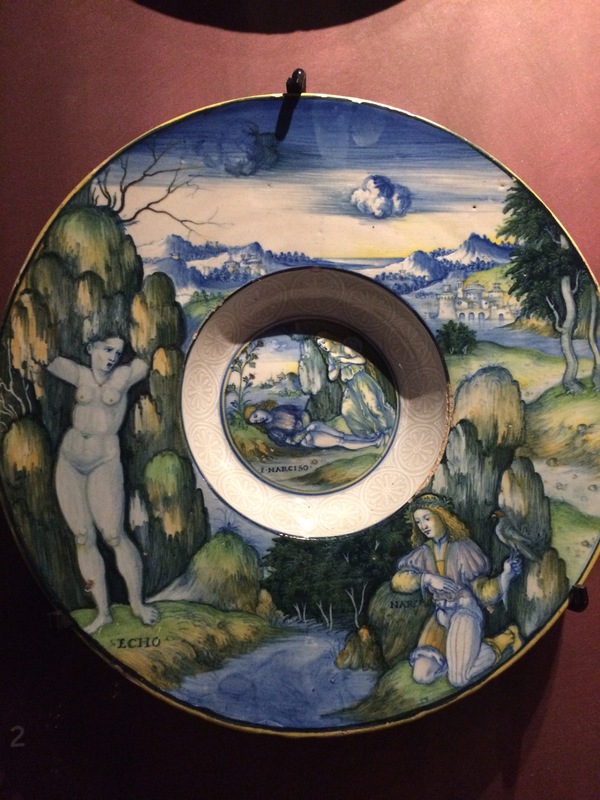 Ceramics are also a favorite and this dish depicts one of my favorite stories from Ovid’s Metamorphoses. Cannot remember the date, but this is likely from the Renaissance. 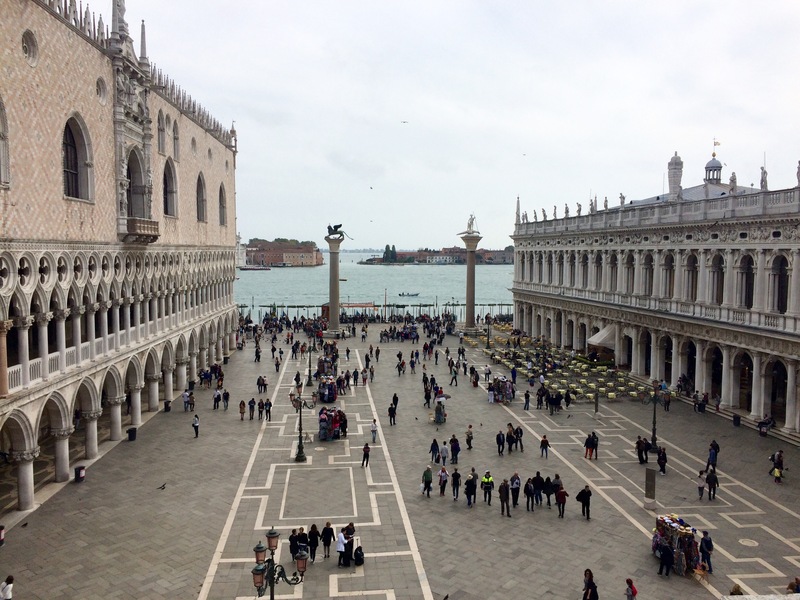 Yet another view from the top of St. Mark’s Basilica looking out toward the lagoon with the Doge’s Palace on the left. 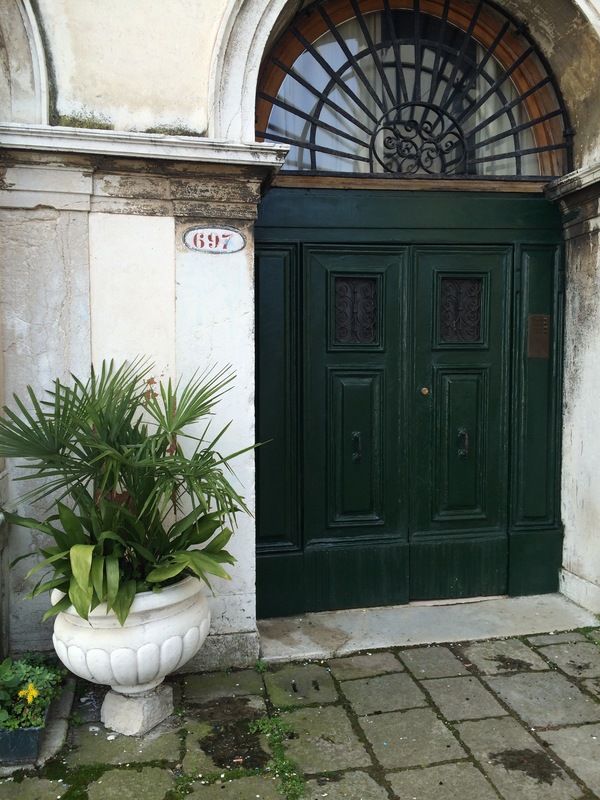 The classical Venetian interior has a lot of dark, heavy wood. 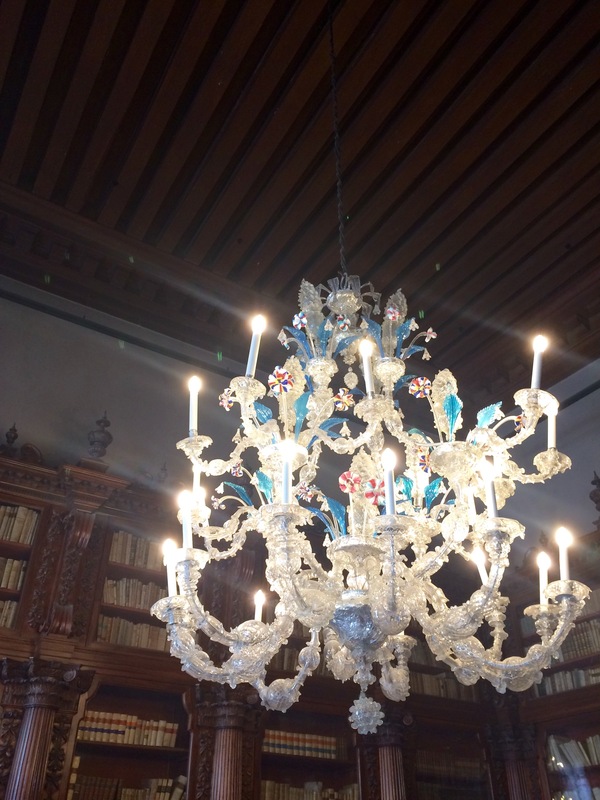 I doubt that was done to showcase fine Murano glass chandeliers, but it sure does work don’t you think? This museum room contained an incredible historic library with books on exploration. 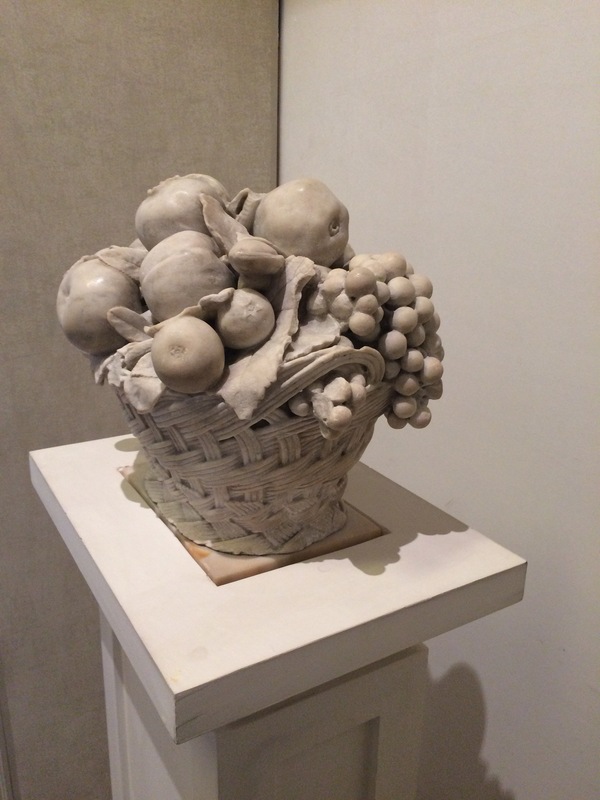 This wouldn’t be Italy, and I wouldn’t be an Italian-American, if I didn’t share a basket of fake fruit with you. John and I both laughed when we saw it. We had to admit this one was quite stylish. 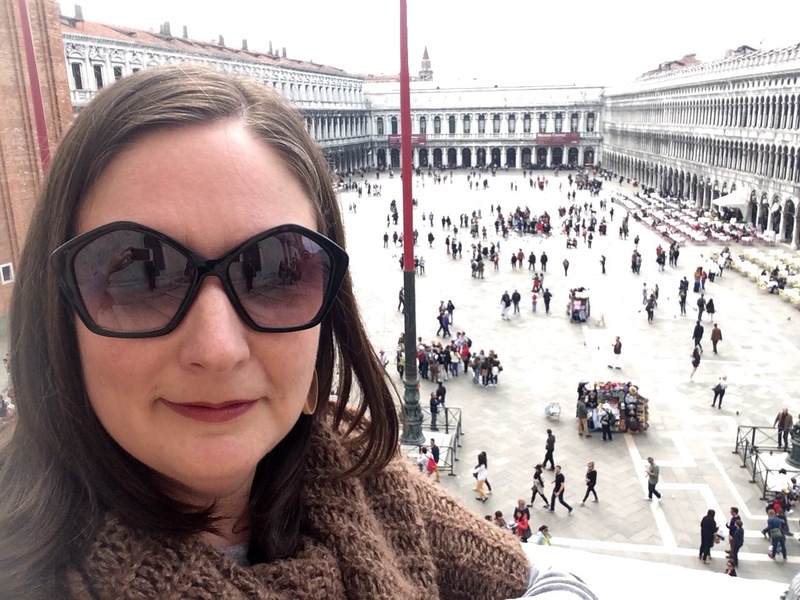 The cafes in Piazza San Marco are well known and can be a lot of fun if you’re there when the crowds are too much. 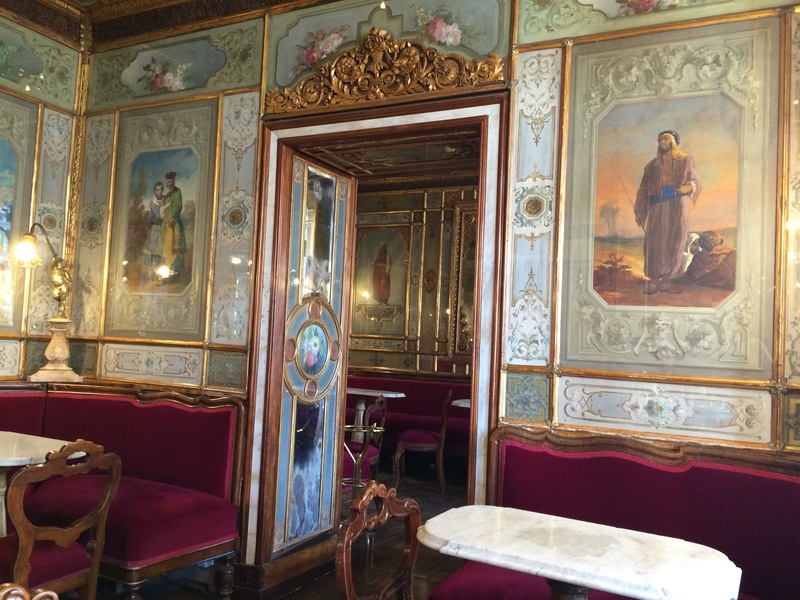 We picked Caffè Florian since it was founded in 1720. For the price you pay to remain in the square to relax, it was worth it with this atmosphere. Outside our window the musicians played and we watched people walk by us. 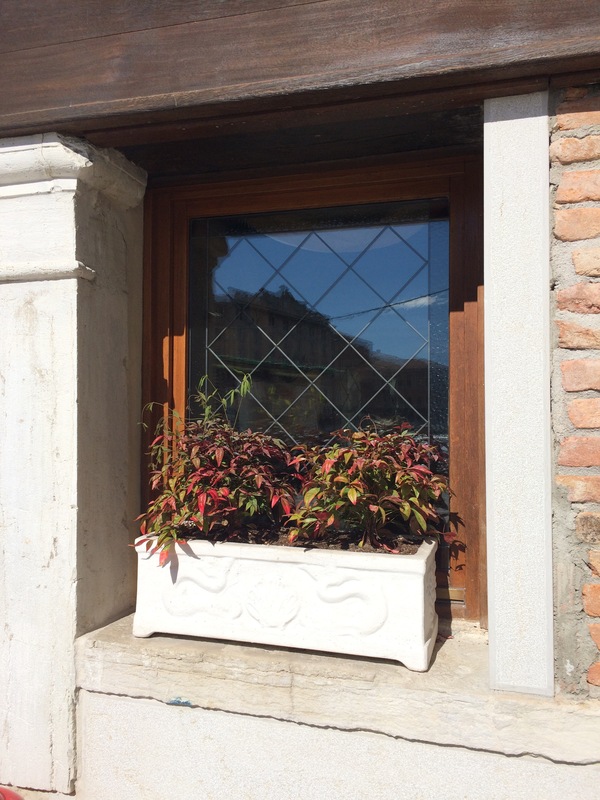 The details in Italy are what boggle my mind and fill my heart with smiles. This incredible concrete work filled my imagination and simultaneously made me hungry. Not everyone has that reaction to tentacles, but I do. This little patio is around the corner from our apartment. 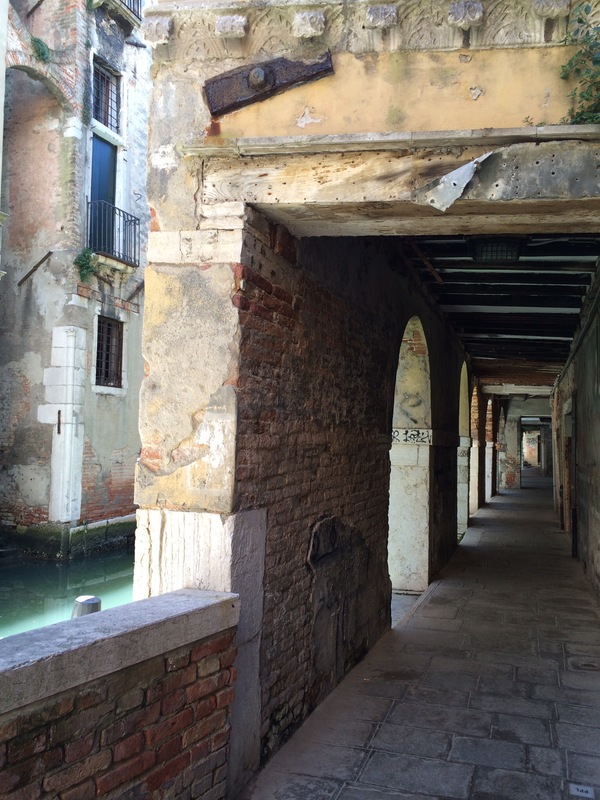 Some of my favorite spots in Venice are passageways such as this one. It too is nearby. From the kitchen porch we have a nice few of the bell tower. But I must see the plants as I wander the streets. 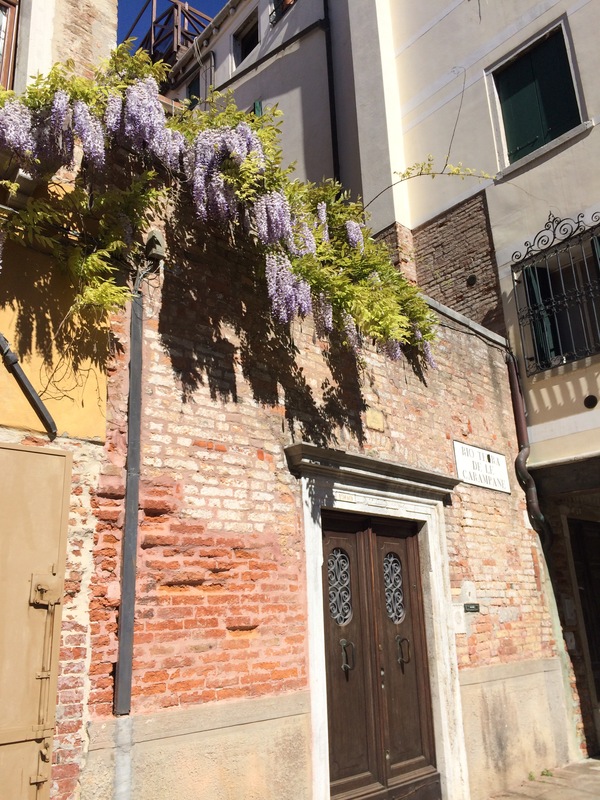 Wisteria is in bloom everywhere. 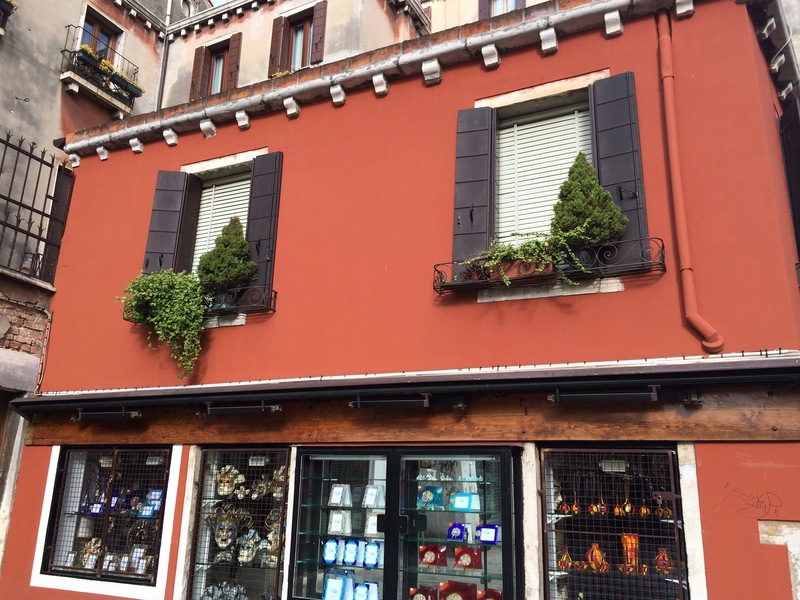 It’s a very popular ornamental plant in Italy. I think their buildings are strong enough to maintain these floral beasts. Everywhere you will find Sedum. This is by far the most common plant. I’ve yet to see it for sale so it must be passed along from balcony to balcony. As you walk you find more and more of the usual low-maintenance suspects. 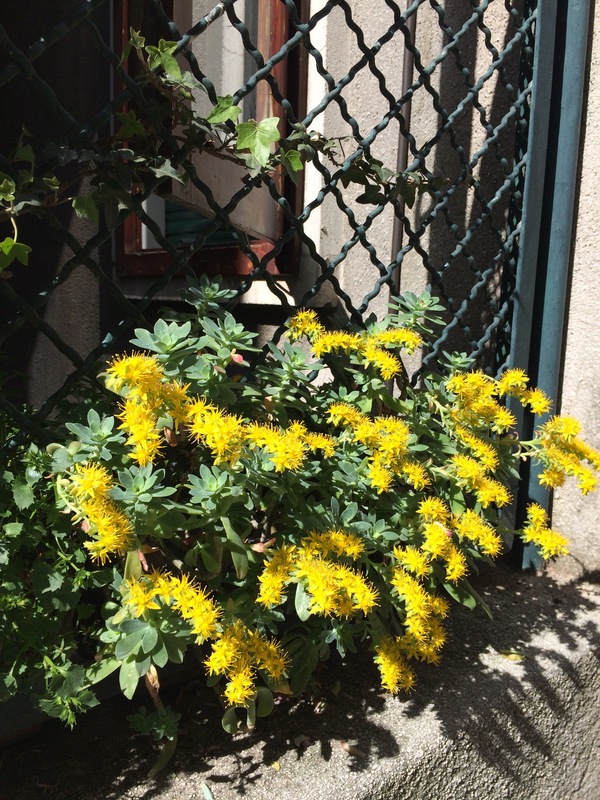 Since there are so few plants here, when you do see them, their impact is strongly felt. Then you find the little collections of potted plants and you know a gardener lives there. This little collection (in both pictures) was being cared for by an old man. Leaving to pick up a rental car other morning I saw these boxes and thought it was strange I hadn’t seen a Dwarf Alberta spruce in several weeks. 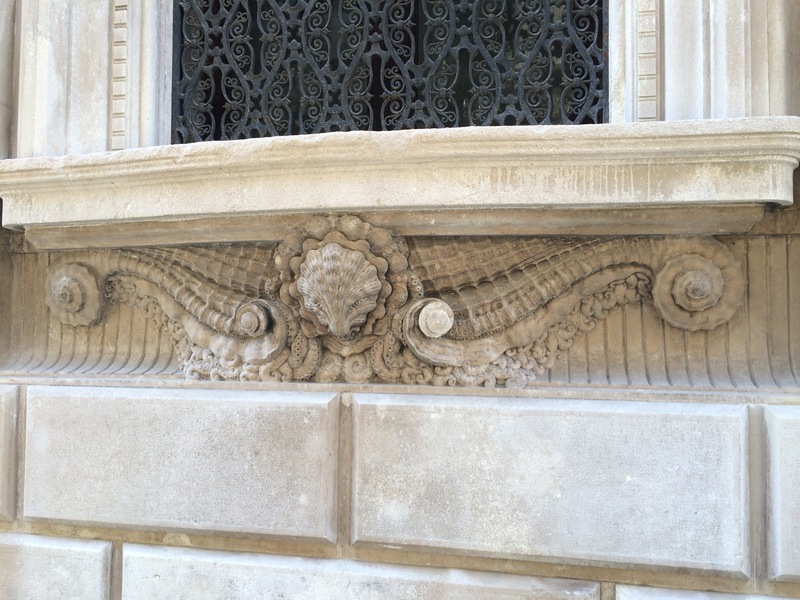 We also noticed this on a building. Reminds me a bit of Napoleon’s bee, but I’m not sure if this building was connected to him. He did loot the place and rearranged a few things before passing it along to the next ruler. So glad Venice is free now. Last time we were here I really wanted to get something for the garden. This time, I am returning to this shop to pick up a few pieces. 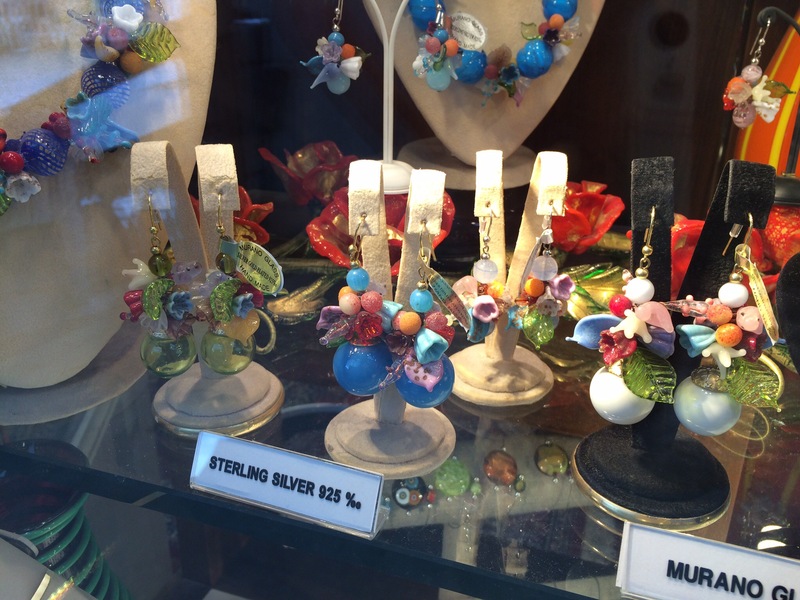 Wish I could get a matching earring a necklace combo while we’re here but I can’t afford them—maybe next time. Being able to stay in Italy for a month was really the greatest treasure I get to take home. “things could look better if they just tidied things up”…what? No! 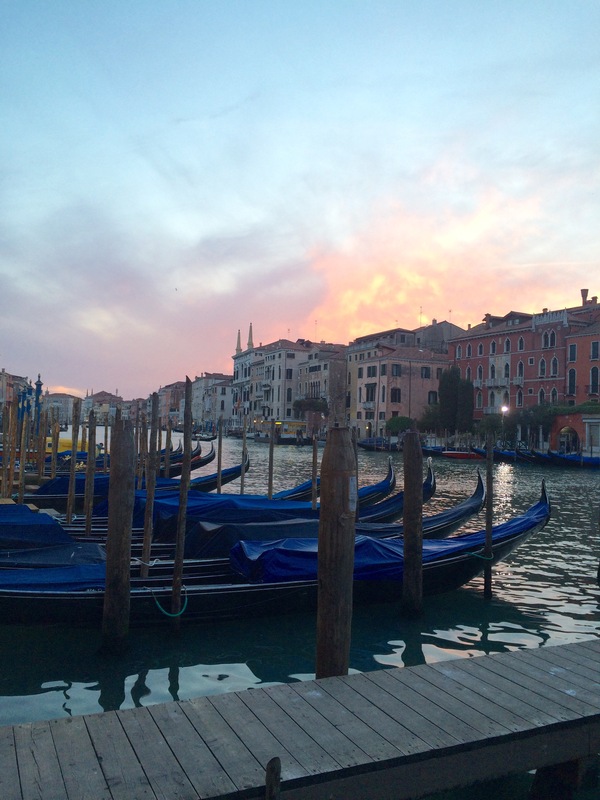 Italy is perfect just the way it is. Who wants to tidy it up? Oh those soft upholstered chairs at the cafe cracked me up! New sunglasses? I agree! I clearly know now that I am more of an Italian gardener than I realized 😉 The upholstery was divine. I wanted my fluffy little LuLu there so badly! And yes, new glasses. I sat on my old ones before we left. They lasted for about 4 years so that’s a record. Wish I could afford some of the designer ones from downstairs. So many things I wish I could buy.